If you’ve ever wondered how it feels for your soul to be gently rocked to contentment and then personally escorted to your choice of a heavenly afterlife, then look no further than Sam Smith‘s performance of “Lay Me Down” at the 2015 BRIT Awards. It was a simple performance, with Sam’s incredible vocals being the main focus, and considering how fantastic he sounds live it’s all we really needed. If you were wondering just why Sam was the winner of four Grammy Awards earlier this year, check out this performance and prepare to be reminded. The other super cool part? His orchestra was dressed in all white, but the entire set behind him was bathed in a blue light, with a projection of blue ink blots spreading out above the orchestra until it all transitioned into a purple light. It was an understated visual, reminiscent of the silent way Sam kind of crept up on all of us over the past year or so. When “Stay With Me” first his US radio, we were like “Okay, this is a pretty great song,” but then months later we realized we were filling our entire Spotify breakup playlists with his entire album and weeping along to his super sad, emotive music. He’s like the therapist we never knew we needed, but boy are we grateful for his existence. 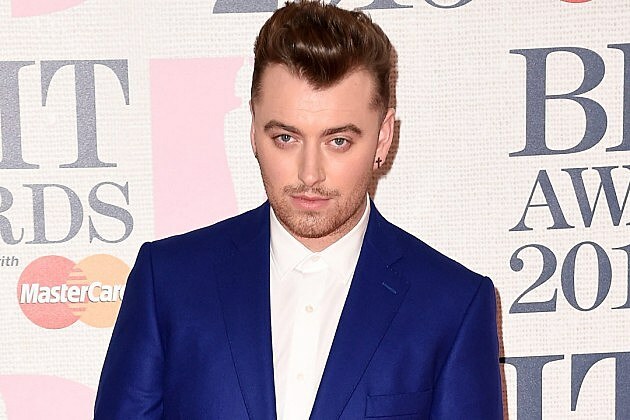 See the Best Dressed Celebs on the 2015 BRIT Awards Red Carpet!